I’ve never made her viral cookie recipe or her viral chickpea stew recipe, but thanks to Alison Roman, ground lamb has gone viral in my heart. In her 2017 cookbook Dining In, Roman has a recipe for “Crispy Chickpeas And Lamb With Greens And Garlicky Yogurt.” I tried it because, frankly, it’s really easy: You cook up some ground lamb in a skillet, set the meat aside, then cook up a can of chickpeas in the same skillet, soaking up what Roman has dubbed the “lamby drippings.” Add some cumin and pepper flakes, and serve on a bed of garlic-heavy Greek yogurt, and you may want to take a bath in your skillet. First, the basics: a lamb, for those of you who never did picture books as a kid, is a juvenile sheep, typically within a year old. (Happy springtime, by the way.) The meat is a staple in cuisines all across the globe, but especially in Indian, West African, British, and Mediterranean cuisines. It’s been argued that lamb is the most ethical meat to consume, the tl;dr of which is most lambs are sufficiently fattened up on a diet of grass, and are thus mostly field-raised. Grass-fed meats, generally speaking, are healthier than their grain-fed counterparts, which includes mass-marketed ground beef. While it’s slightly fattier than ground beef, lamb being grass-fed means it’s healthier. But this isn’t a health blog! I don’t care what you eat, as long as it tastes good, and lamb recipes taste freaking delicious. Compared to beef, lamb features a robust, earthy flavor. According to an interview with food writer Molly Birnbaum, that particular, lamby taste comes from a fatty acid—called a branched-chain fatty acid—present in sheep and not cattle. That little acid creates the big, instantly-identifiable flavor that some might call gamy. That bold flavor is, I think, what folks find intimidating about cooking with lamb. But I find that an argument in favor. Instead of having to dress the meat up to make it taste like something, you’ve already got this big, delicious built-in taste. The meat does most of the heavy lifting for you—that’s what makes lamb so unique, and so dang easy to work with. You’ve seen this on the menu at one of those burger places that have 80 different varieties on the menu. Given those odds alone it wouldn’t be outrageous if you’d never ordered the lamburger. But it’s an easy home-cooked meal, too: Mix ground lamb, a couple minced cloves of garlic, an egg, red pepper flakes, bread crumbs (I use mashed Ritz crackers for mine), salt, and pepper in a large mixing bowl. Cook the burgers in the grill. Once cooked, top the burgers with a yogurt spread: Greek yogurt, minced garlic, lemon juice and salt and pepper to taste. 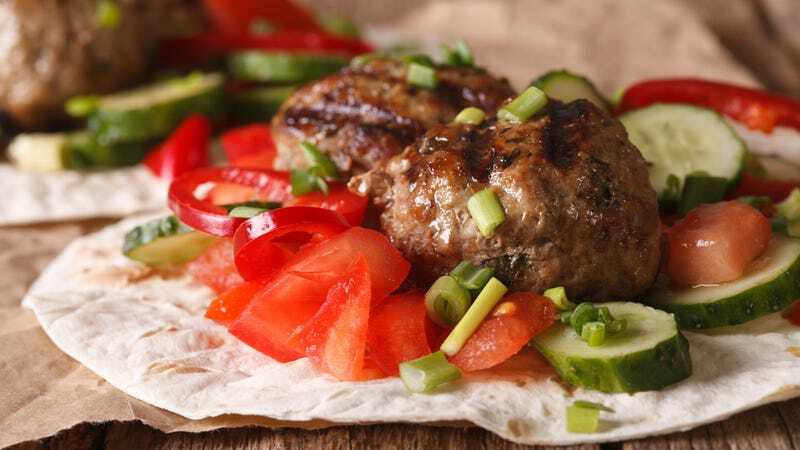 You can also add some parsley and cucumbers to serve—and, if you’re really feeling yourself, serve the burger in a pita. Yeah, meatballs are basically just sliders shaped more spherically. But they’re an underrated way to make a dish feel like a meal. Mix ground lamb, bread crumbs, an egg, cumin, half a minced onion, and some salt and pepper. Roll them into twelve even-sized balls, about 1 1/2 inches in diameter. Broil the meatballs for about 8 to 10 minutes. Serve on top of your lunchtime salad, your favorite pasta, couscous, rice, or your grain of choice. Toss olive oil in a skillet on medium, then add onions and let them cook for a minute. Then add the ground lamb. Add salt and pepper. Break the meat up for the first minute or so it’s cooking, to make sure it’s crumbly. Cook the meat through until it’s totally browned, about 10 to 12 minutes. Once there are no more pink spots, transfer the meat off the heat. Then prepare the tacos: add the ground lamb to a tortilla, and top it with mint, feta, and those browned onions in the skillet. The point here, folks, is that ground lamb is as flavorful as it is easy to work with, so you have no excuse to be intimidated by this particular protein. It’s Aries season, after all—time to have your ram and eat it too.